US, 2002, 120 minutes, Colour. Derek Luke, Denzel Washington, Joy Bryant. It is difficult to dramatise goodness. Far easier to deal with conflict and evil - and more absorbing for audiences. This is very much the case with Antwone Fisher, only a moderate success at the American box-office and looked at with something of disdain by non-Americans who dismissed it as being too 'worthy' or that the ending was too clean-cut for an otherwise stately and thought-provoking movie. 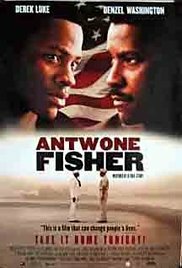 Yet, Antwone Fisher survived his past, wrote this screenplay as well as a fuller memoir after the filming. And, perhaps, the ending is not quite as clean as all that because Antwone, while he finds his mother, does not relate lovingly to her and there is no indication that he will return to see her, no matter how much the audience wants this to happen. Derek Luke was working at the Sony studio's gift shop and by chance met Antwone Fisher. He went for the part, his first, and acquits himself admirably. On screen for virtually the whole film, he takes the audience through the difficulties of his life in the navy, his reluctance to undergo the obligatory psychological sessions, his gradual change, his hesitance in committing himself to a relationship. We share his discovering love. We share the tragedy of his birth, abuse by carers, the death of his best friend. We finally share his discovery of mother and family. It is interesting to see Viola Davis early in her career has Antwone’s mother. Denzel Washington makes his directorial debut and has a substantial role as the navy psychiatrist. The screenplay gives some substance to Dr Davenport's story outside his office, tensions as he and his wife are unable to have children, his personal edginess, his seeing Antwone as a surrogate son, his own healing by the trust Antwone places in him. Not exciting or action-packed but a fine portrait of a man and his healing of memories. 1. Based on a true story? The central character writing the screenplay? An authentic feel? 2. American cities, Navy bases, psychiatrist rooms, homes? City of Cleveland, the suburbs? Authentic feel? The musical score? 3. Antwone Fisher and his life, his mother pregnant, giving birth in the prison, his father killed by vengeful girlfriend, his being an orphan, in the orphanage? Mrs Tate as foster mother? The husband, the revival preaching, the singing in church? The other boys in the house, black, mixed race, being whipped by Mrs Tate, humiliated, her racist language? The girl in the house, the sexual abuse of Antwone and its effect on him? His brothers, their lives later? Jesse as his best friend, confiding in him? Antwone spending his childhood and adolescence in this household? The effect? 4. His joining the Navy, the training, learning Japanese, world travel? The significance of his anger, the taunts of the fellow sailors? His attacks, fights? Charges, demotion? 5. His being sent to Jerome Davenport, to deal with his anger, his silence in the room, not answering questions? The demands that he attend, to have three sessions? The encounters with Cheryl outside, shyness, her friendship? His eventually beginning to talk, difficulty with questions, getting Davenport to ask? The cumulative effect of their talking? The flashbacks visualising his past? 6. His self-awareness, the angers because of so many losses in his life? The Jesse story, Antwone being down and out, going to see Jesse, welcomed, going to the store, the robbery, Jesse being shot? Antwone feeling that significant people had abandoned him? His feeling that Davenport would leave him? 7. The character Davenport, Navy psychologist, his easy manner, his quick wits in asking the right questions, seeming casual, drawing out responses? Yet the formality at home, the tensions with his wife, his explanation of their not being able to have children, the effect on each of them? The silences at home? Antwone, coming to visit Davenport, early, meeting his wife, the glass of cider? Davenport’s reaction? Calling him back, the invitation to Thanksgiving dinner? The formality of his dress, introduction to the family, the older generation? Enjoying the meal, the old man and his questions? Antwone upset, leaving the room? Talk with Davenport – offering him the problem that himself and his sense of abandonment? 8. Davenport encouraging him to go out with Cheryl, her personality, her job, the Navy family? Going out for a drink, talking, having something to eat? Antwone happy, Cheryl giving him a peck on the cheek? Telling Davenport? 9. Their going to his graduation, Davenport telling him that that was the end of the sessions? Antwone upset? 10. Davenport urging him to find his family, to resolve his sense of loss and his angers? Talk with Cheryl, the decision, inviting her to go to Cleveland with him? Love, the sexual encounter and its effect on him? Getting the file, the sympathetic official, the phone book, all the calls to the family? Knowing the name of his father? 11. Finding the family, the joy, taking him to visit his mother, her apartment in the projects, listening, his speech, his kissing her, forgiveness, and not responding – but her tears when he left? His being welcomed into the large family and discovering cousins and relatives? 12. Going back to Davenport, expressing his appreciation, Davenport telling him about his relationship with his wife, thanking him for his help? The father-son relationship? 13. A film of warmth and humanity? A film about adoption and its consequences? Fostering? The possibilities of discovering birth families?